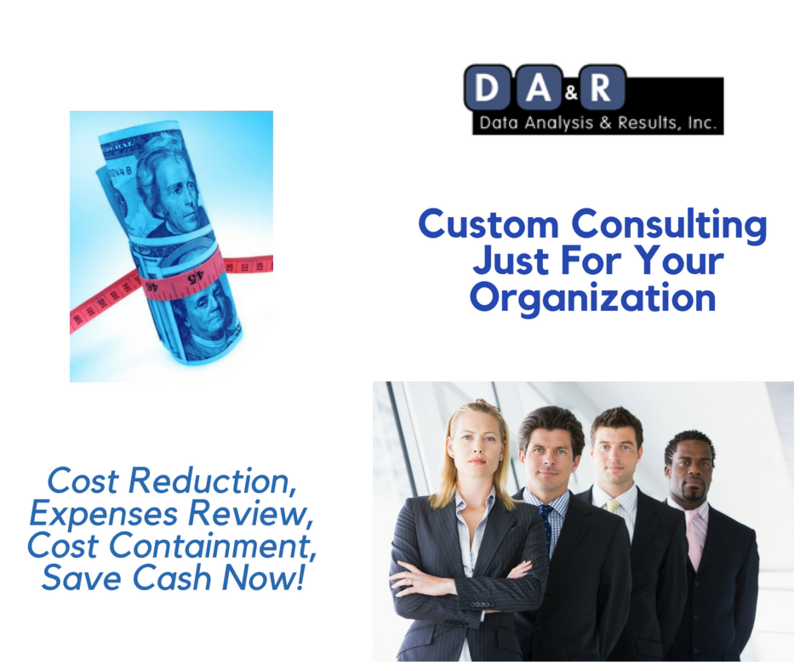 Cost Reduction & Savings | Data Analysis & Results, Inc.
We only look at indirect, fixed monthly costs, nothing related to one-time purchases or labor costs. We are compensated based on a percentage of realized savings (no upfront fee) – if we don't save you money, you don't pay. On average we reduce costs 20-30% without switching your vendors or service levels. Software, processes, tools, sources of funds, training, and services review. We assure that you are using the right people to do the right tasks in the right way to reduce your financial services, banking, CPA, and legal fees. We review with our Alternative Financing experts your loans, capital, investments, and cash flow. Frequently we reduce costs by inserting a layer between you and your CPA and Legal firms. If you are not using bookkeeping services we analyze lowest cost for local or remote, secure, cost effective services. We also ensure your accounting structure is optimized to take advantage of all deductions for needed expenses. For Insurance we review your current coverages to best practices to drive down your costs and increase your coverage where advisable. Most clients benefit almost immediately from a partial technology refresh, many times reducing costs at the same time. Review of your current and optimal technology implementations. Apps, Moving to the Cloud, replacing outdated servers with AWS, Dell, or Microsoft online platforms and more... We work with partners who can likely reduce your benefits costs without reducing benefits! Analyze and review all purchasing and other vendor contracts, processes, and approvals. Optimize your buying, affinity programs, rebates, discounts, lease or purchase, and more. Wipe and sell electronic equipment such as PCs, Printers, Routers, and more. We can sometimes find government programs that award grants, rebates, or other incentives. We search for overpayments and negotiate best in class pricing. Only at your request will we switch vendors. This is an area of frequent savings. Shippers are changing the way they charge for shipments to include outside dimensions as well as weight. We review and negotiate contracts, processes, and vendors to ensure you are operating your logistics at peak performance and lowest cost. We look at all waste streams to determine if they can be sold or bartered. We look at packaging and Public Relations opportunities as well.